Sven and I had our first falling out last night. We’ve been seeing each other for 6 weeks but I’m not really sure you could call us a couple. I guess we fall under the category of “dating”. Neither one of us is seeing anyone else and we’ve seen a fair amount of each other in the last 6 weeks but things have been going very slow. I’m OK with that, normally I rush into things so slower is a good change of pace this time. However this slowness does not mean that nothing is happening. Yesterday I bared a little bit of my soul to Sven and I was surprised by the response. Perhaps surprised is the wrong word, more like miffed or upset or just generally pissed off. He treated the whole thing with a kind of nonchalance or even dismissal that I didn’t appreciate. I explained why I was upset and he said that he felt like a jerk about it but I don’t feel better. I’ve been trying to deal with my angry feelings, I wrote about them last night to try to acknowledge and release them but the positive result was short-lived. The angry feelings keep returning. I know that I will forgive him at some point but right now I’m irritated and I can’t seem to let it go. I thought that if I messaged him today and told him how I felt I could finally resolve things. He agrees that we should talk but wants to do it in person so that puts everything on the back burner. I need to resolve this for me NOW. I don’t want to carry these angry feelings around all weekend. I need to dispel them, I need to figure out how to move past them. You would think that I would have the tools at my disposal to alleviate this anger but personal growth is hard work. I’m hoping that writing things out here will help and I think I will try meditating this afternoon. I want to have a good weekend and free myself from negativity. Maybe some exercise will do the trick. I should go for a walk and clear my head. Time to get off the computer I guess ;). 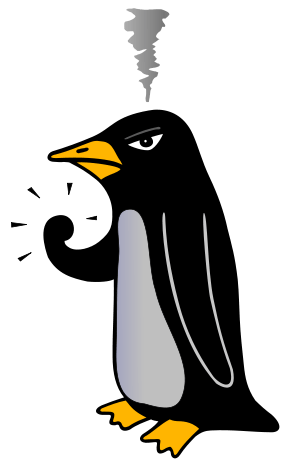 The angry penguin is funny, his anger makes me smile :). Thanks for your positive thoughts!